Army kukris series are the series of kukris Gorkha Army used from ancient times that put themselves into the history book to the mordern day issued kukris. They may differ in shape and sizes but the way they were made then and now remains unchanged and so does the only motive when pulled out must taste blood. "Kill or get Killed". 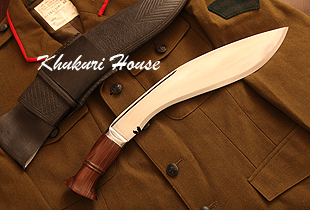 Army Kukris series comprise of Jungle Kukri for combat and training, Service No 1 kukri on enlistment, Service Ceremonial kukri for special accasion parade (Modern day), Historic kukri issued in world war I and II, Aaitihasik kukri issued to the Gorkhali army in the 18th century, Nepal Army kukri issued to Nepalese Army during enlistment, Nepal Police kukri to Police forces during their service and Regimental Kothimora for retiring officers from the army.